Mount Sinai researchers have discovered that a particular type of cell present in bladder cancer may be the reason why so many patients do not respond to the groundbreaking class of drugs known as PD-1 and PD-L1 immune checkpoint inhibitors, which enable the immune system to attack tumors. 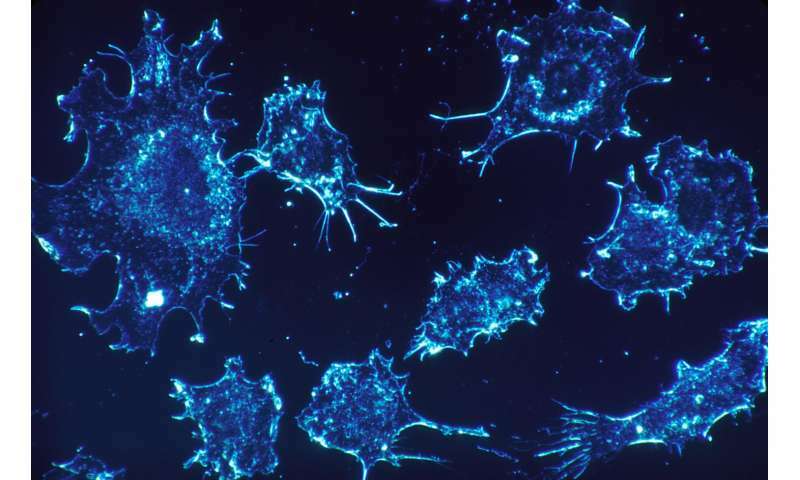 In a study published in August in Nature Communications, the Mount Sinai team reported that stromal cells, a subset of connective tissue cells often found in the tumor environment, may be preventing immune cells known as T-cells from seeking out and destroying the invading cancer. The researchers showed that expression of a set of genes that are typically linked to more aggressive cancers was actually more commonly linked to stromal cells rather than bladder cancer cells themselves. They also showed that tumors with increased expression of these genes, known as epithelial mesenchymal transition genes, did not respond well to immune checkpoint inhibitors. The researchers also found that in such tumors, T-cells were more likely to be separated from cancer cells by the stromal cells, suggesting that the stromal cells may be hindering the ability of the immune cells to reach and eradicate the cancer cells. "Some bladder cancers may not respond to immunotherapy, even though the body has developed an immune response against them, because the T-cells are prevented from reaching the tumor by stromal cells that create an inhospitable 'neighborhood,'" said Matthew Galsky, MD, Professor of Medicine and Director of Genitourinary Medical Oncology at The Tisch Cancer Institute at the Icahn School of Medicine at Mount Sinai, and senior author of the study. Dr. Galsky and his colleagues are now trying to validate the gene expression identified in their study as a biomarker that could help refine clinical trials and treatment in the future by predicting the level of response or resistance to PD-1/PD-L1 inhibitors. In addition, according to Dr. Galsky, the group is identifying ways to "counteract the negative impact of the stromal cells and make that neighborhood more friendly to immune cells so they can finish their job." Since they were made available to patients about four years ago, immune checkpoint inhibitors have changed the treatment landscape for many types of cancer, particularly metastatic bladder cancer, which had gone several decades without significant therapeutic advances. While five different PD-1 and PD-L1 inhibitors have since been approved by the U.S. Food and Drug Administration, responses are achieved in only 15 percent to 25 percent of patients. Cancer researchers have turned their attention to attempting to learn why and, more specifically, to discovering ways to increase the proportion of patients with positive results. The Mount Sinai team used several data sets for their study, including genomic data from The Cancer Genome Atlas' bladder cancer dataset from the National Cancer Institute. In addition, in collaboration with researchers from Bristol-Myers Squibb, they demonstrated the potential clinical relevance of their findings in a large clinical trial dataset derived from patients with metastatic bladder cancer treated with the PD-1 inhibitor nivolumab. "Our biologists and biostatisticians were able to harness 'big data' to generate valuable insights into responses and resistance to PD-1 therapies," noted study co-author Jun Zhu, Ph.D., Professor in the Department of Genetics and Genomic Sciences at the Icahn School of Medicine at Mount Sinai and Head of Data Sciences at Sema4, a Mount Sinai venture. "We strongly believe those results will inform future studies at Mount Sinai and elsewhere." Dr. Galsky added, "What our group has done is add another important piece to a larger jigsaw puzzle about why PD-1/PD-L1 inhibitors don't work in some patients. Through our work we have supported and extended important observations made by other researchers, and this makes us more confident than ever that we are on the right track to addressing a huge unmet need for patients with bladder cancer."